The N7100 series bumps the resolution to 4K UHD, and has solid picture quality with a good front and center viewing black levels and color saturation. HD 720P, 1080p signals and lower are upconverted by the Revelation upscaler. This is one of the most important elements of any 4K TV as there is still little available content. Most of what we watch is still 1080p (if we're lucky) but mostly 720p and 480p. My take is that if future HDR content is a major consideration to you, then this is probably not the TV for you. HDR is a ways off really getting going with content. The N7100U is HDR “enabled” meaning you will be able to accept HDR mastered content and display it, but not in its full glory. You would see it in HD or 4K or whatever the resolution is but without the HDR widened and brighter color spectrum. Colors and black levels do degrade at side angles starting at 15 degrees off center. Brightness levels are fine. There is some perceived lack of depth in on-screen images. Aquodimming is present in this TV, which is contrast enhanced in areas of the screen by manipulating the backlight. The effects seem negligible when testing. Full array local dimming is a major benefit as LED backlights are controlled by zonal manipulation in such a way that they can help increase contrast in various areas of on-screen images. In a 70” TV they are especially beneficial. We give the N7100U an average rating in full array local dimming processing and presentation, but the feature is welcome. 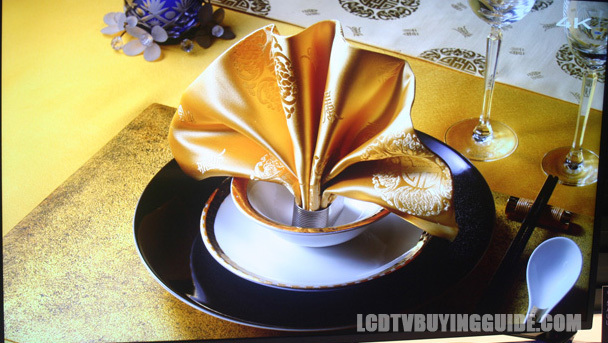 A stunning 4K image displayed on the Sharp N7100. Obviously, the N7100 series is a value oriented 4K oriented TV., but it still packs some surprising features. It has a built in streaming Apps selection including the usual suspects that you use most like Netflix, Amazon on Demand, and You Tube. Built in Dual Band Wifi. An Apps store and web browser. And a media player/receiver. It also has the Sharp “Aquomotion” designation which manipulates the backlight in order to show a perceived smoother picture (increased Hz rate designation). Gaming input lag is very average on this TV, not up to par with mid range Samsung, LG and Vizio models. The 70N7100 series is a high value focused model with 4K resolution and a good upscaling engine. At around $1899 the 70N7100U is a great value for this size and quality of TV if you are not sensitive to the TV having a great Streaming Video package. You get 4K resolution, HDR enabled, the quality Sharp panel and though it's not the best panel in the market, it's hard to argue with the price.